Now it's time to be creative with your favorite toppings and of course, a nice drizzle of olive oil to finish off your pie. 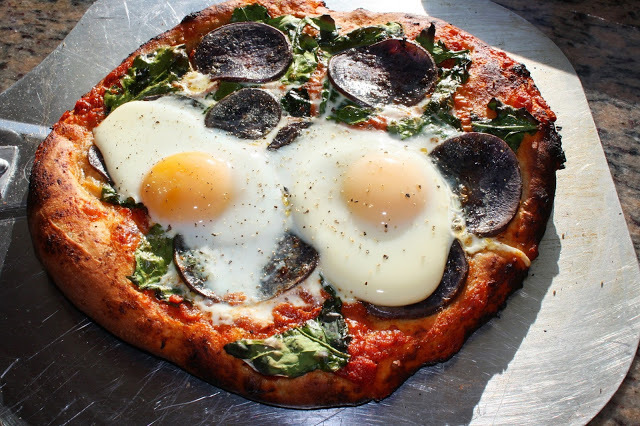 My grilled pizza pictured above is made with a garam masala curried tomato cream sauce, thinly sliced purple potatoes drizzled with Picual Extra Virgin Olive Oil and dusted with cumin, baby beet greens, and farm fresh eggs. Toppings to consider: Pesto, pizza sauce, mozzarella, olive oil, Parmesan, thin sliced potatoes, baby greens, arugula, peppers, olives, eggs, smoked salmon, squash, grilled chicken, shrimp and on, and on. Mix the granulated sugar in to 1/4 cup warm water and add the yeast. Allow to sit and "bloom" for five minutes. In a large mixing bowl, or in the bowl of your stand mixer, or in your bread machine, add the flour. Mix the yeast mixture in to the remaining two cups of warm water along with the salt and olive oil. Add this to the flour in the bowl and slowly begin to mix it until it's fully incorporated and smooth but slightly our flour. This slightly wet dough helps to create a beautiful cracker crisp crust if rolled very thin. If left thick, it will make a chewier crust. Divide the dough in to six portions. Keep the portions of dough not being rolled covered so that they don't dry out. Roll out each portion to desired thickness. If you do not want to use cornmeal, you can roll out your pizza dough on to small sheets of parchment paper. The pizza and parchment will go directly on to your hot pizza stone for a minute, and then the parchment should be removed after a minute or so, when the pizza dough is par-cooked which will allow it to slip off the paper easily, and directly on to the hot stone without sticking. You can also use cornmeal to help the pizza off the peel and on to the grill or stone. If grilling your pizza directly on the grill without a stone, reduce the grill heat to medium and use corn meal to help slide the of your peel and directly on to a medium grill.